The students on qualifying examinations and meeting membership requirement are awarded membership of the Institute which is a professional and legal status to join the fraternity of Institute’s members. The membership is a life-longassociation which tends to continue by paying prescribed annual subscription fee. Currently, the Institute has over 5,000 members in Pakistan and abroad. 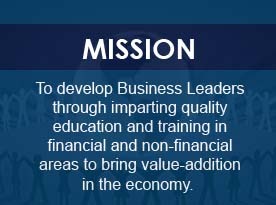 Out of total members, about 20% of members are serving abroad which shows the contribution of the Institute towards global economic development. 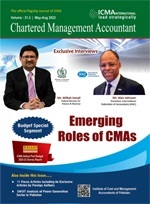 The Management Accountant is an official journal of the Institute which benefits both members and students in particular and its readers in general to update their knowledge about International Accounting Standards, new management concepts, changing business scenarios and spectacular developments taking place in Information Technology. To keep members and students in particular and other professionals in general, the Institute as part of Continuing Professional Development (CPD) regularly organizes nationwide trainings, seminars, workshops and conferences. The CPD activity helps in the capacity building and is essential for a professional to remain updated with the changes taking place in the profession. The deliberations made and insightfulness shared in these CPD programs become a source of immense learning for members and students. At an average, in a year, more than 2,000 CPD hours are nationwide conducted at the Institute. The Institute has a proper quality Control system in place that encompasses policies, procedures and periodic reviews of the work of CMA Firms engaged in public practice. The objective is to ensure that practicing members and firms are engaged in audit and other practices are in line with the relevant rules, regulations and professional standards. The well-defined Quality Assurance Review Framework helps firms in maintaining set benchmarks and to keep them updated with the changes taking place in the profession to provide state-of-the-art services to the clients. Through Quality Assurance, practicing firms are not only meeting customers’ expectations but also complying global standards followed by practicing firms all over the world. A member desirous to do practice, after fulfilling the requirement, receives Certificate of Practice (COP). The certificate is a license for members to do public practice and management consulting functions. Under the license, a member may act as liquidator, trustee, executor, administrator, arbitrator, receiver, adviser or as representative for costing, financial, company law and taxation matters or may take up an appointment that may be made by Federal Government or Provincial Government or a Court of Law or any other authority established under law, or may act as the secretary of a company in the professional capacity. The Corporate Relations function of the Institute assists students in their career development. It creates training and internship opportunities for students and helps in bringing awareness about the role of profession of management accounting in the industry. Keeping in view that corporate sector is ultimate beneficiary of Management Accountants; the Corporate Relations function invites dignitaries from the corporate sector and takes various steps to strengthen relationship with the corporate sector. Copyright © 2017 ICMA Pakistan. All rights reserved.